A few years back there was a big hue and cry about a major boost to alleviate the energy problem. There is a plant, Jatropha, which was supposed to play an active role to solve the energy crises. This plant produces a seed which can be crushed to extract a light oil for use as a bio-diesel thus reducing our dependence on fossil fuels. Because this plant is naturally resistant to bugs and requires little water or care, big plans were made about using otherwise unproductive soil for growing this crop. Many years ago I had worked with a NGO sponsored watershed program which was involved in commercial development of Jatropha farming. It was started mainly to supplement income for the poorer farmers in regions of Maharashtra where conditions were unsuitable for regular farming. They worked really hard to spread awareness about this plant and how, despite the lack of water and fertile soil, it could be commercially farmed. Hundreds of farmers from many villages participated in the program and managed to supplement their income. Unfortunately, these days the steam seems to be running out from this campaign. Even the media seems silent on popularizing this issue when earlier they were active proponents of this idea. Despite the continuous progress being made to farm this plant, it is no longer in the limelight. Its sad because I really think we can really do with a more aggressive farming of Jatropha. With the fossil fuel situation going from bad to worse globally, I don’t think that any single source of alternate energy will provide a solution. That doesn’t mean that all is lost but that the problem will require inputs from every type of renewable energy source combined together to replace our dependency on fossil fuels. And this otherwise useless plant can really help with India’s energy self sufficiency. On its own it cannot substitute fossil fuels but when combined with solar, wind and other renewable sources of energy, it can be an effective eco-friendly weapon against the energy crises for us and future generations. 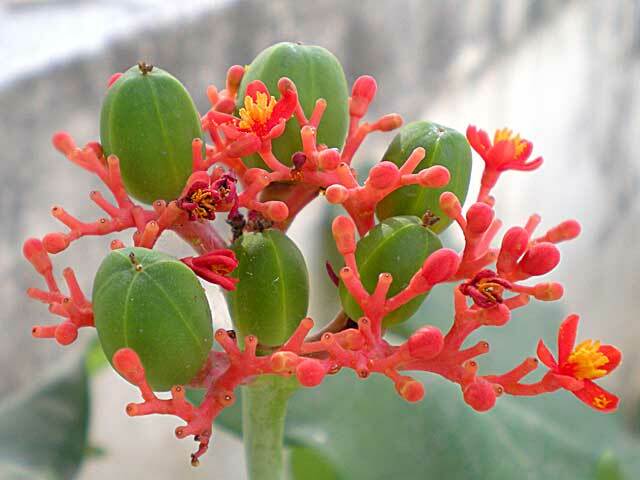 I have a few Jatropha plants growing in our yard outside and despite the lack of care on purpose, these are among the healthiest plants that I have. They are resilient and they are strong. Even if attempts are made to encourage their use in something as simple as natural fences against animal predators in fields, there is enough potential to utilize the inedible and toxic oil from Jatropha seeds for at least lighting purpose in rural homes. The oil from this seed produces flames without smoke and can easily substitute the currently used kerosene which does produce smoke and harmful fumes. The combustible oil from Jatropha is also known as bio-diesel and mixed with regular diesel, has proven effective in powering many public transport vehicles at select places in India. What we need to do is to launch a public awareness program in support of this plant so that everyone encourages and promotes its uses. Unless a greater awareness is made through the general public and through our education systems, the future generations will remain in the dark about this plant and we may end up losing this excellent source of renewable eco-friendly energy. Initially the gains may be slow and without monetary profits, but even the fossil fuel technology took decades of expensive development to reach the stage where it was commercially viable to use it for powering our lives. I think with concerted efforts and greater public involvement, Jatropha farming may yield much more useable results with much less time and effort.